As butterflies diffused northward after the glaciers ebbed, northern populations differentiated from their southern relatives by evolving or retaining plainer, less brightly colored strains, for better camouflage in deciduous northern forests. We see an example of this process in the Northern/Southern Oak Hairstreak, the Northern being much plainer than the bright Southern. The two were recognized as a single species only in the 1980’s, as a result of evidence of clinal variation in wing patterns in the southeast ( Robbins 1994; Scott 1986: 381; see Cech 2005 for good comparative photos). Our ‘Northern’ Oak Hairstreak is recognized as subspecies Satyrium favonius ontario, while the ‘Southern’ Oak Hairstreak, found in Georgia and Florida, is Satyrium favonius favonius (Pelham 2008). The common name, Oak Hairstreak, was created by the North American Butterfly Association as a convenient label for the species as a whole (NABA 2001). The Northern Oak Hairstreak was first described by W. H. Edwards in 1868. In 1889 Scudder called it Thecla ontario or Northern Oak Hairstreak, and believed it to be the “rarest of our Theclinae” (1889: 875). He had only two Massachusetts specimens, from Amherst (Merrill) and Waltham (Thaxter), and knew of only two more, from Connecticut and Ontario. Maynard (1886) called it an “extremely rare straggler.” There are no Massachusetts Oak Hairstreak specimens in the Harvard MCZ earlier than 1972. In his mid-century review of New England butterflies, Farquhar (1934: 293) calls this species “very rare,” and lists no new specimens. Harry Clench, New World hairstreak expert who lived in Massachusetts in the late 1940’s and collected extensively in the Blue Hills area, never found this species and believed that it was exceedingly rare in Massachusetts at that time (pers. com. H. Clench to R. Robbins, 1973). Thus there are no Massachusetts Oak Hairstreak records between 1900 and 1972. That year, 1973 and 1974 seem to have marked an eastern Massachusetts population expansion. From 1972 there is a Nantucket specimen with the unlikely date of September 24, collector unknown (MCZ). More reliably, entomologists R. Robbins and J. Levy found many Oak Hairstreaks at Middlesex Fells, Medford, in 1973, taking ten specimens June 28-July 5. D. Winter reported one in Dover, collected by J. Ingraham on June 30, 1973, and Robbins found the species again in Dover on July 10, 1974 . Darryl Willis reported collecting fourteen specimens in the Holliston-Sherborn-Framingham area in 1973, and three in 1974 (Lep. Soc. Seas. Sum. and Corresp., 1973, 1974). One D. F. Schweitzer specimen from 29 June 1986, Medford (probably Middlesex Fells), is in the Yale Peabody Museum. ‘Northern’ Oak Hairstreak lays its eggs on white oak (Quercus alba), post oak (Q. stellata), and laurel oak (Q. laurifolia) (Scott 1986). Of these, white oak is by far the most common in Massachusetts; white oak abounds and is the probable host at one well- known Oak Hairstreak site, Canton Great Blue Hill (D. Wagner, pers. com. 6/27/2013). Post oak is native only to the southeastern counties and the islands (Cullina et al. 2011). Oak Hairstreak may also use post oak or scrub oak (Q. illicifolia). in Massachusetts, but actual evidence is lacking (NHESP 2007). Oak Hairstreak habitat is mostly open oak forests but also pine-oak barrens. It can be difficult to locate because it often perches high in the canopy. It is usually seen when it descends to use nectar sources in nearby open areas. Favorite nectar sources are New Jersey tea (Ceanothus americanum), dogbane (Apocynum), and milkweeds (Aesclepias). MBC observers find it on thistle, knapweed, and yarrow at the top of Great Blue Hill in Milton/Canton (see photo above). Bob Busby found females at flowers mainly late in the afternoon in Woburn and Middlesex Fells in the 1970s (pers. comm, R. Robbins, 12/16/2010). Larvae feed on new oak growth in spring – pollen, flowers and leaves (NHESP 2007). As with other hairstreaks, larvae are probably tended by ants. Oak Hairstreak was termed “rare and local” during the 1986-90 Atlas period, but it was found in nine of the 723 blocs and in nine separate towns. MBC reports 2000-2007 rank it as “Uncommon to Rare”, which suggests some increase in relative abundance compared to Atlas years (Table 5). Certainly, it is no longer as rare as it appears to have been in Scudder's day. Note: Duplicate counts from the same location on the same or adjacent dates have been eliminated in Chart 23. A recent analysis of 1992-2010 MBC data using list-length methodology did not find an increase in Oak Hairstreak over these years, but rather a 73% decline (G. Breed, S. Stichter, and E. Crone, 2012). This conclusion is probably erroneous. List-length analysis does not use the number of butterflies seen, or the number of reports made, but rather the length of the sighting list on which the species appeared. Most Massachusetts Oak Hairstreak reports were not suitable for inclusion in a list-length analysis, since they were made as special reports of just the one species. The omission of many Oak Hairstreak reports probably led to an erroneous conclusion in the case of this species. Also in 2011, Oak Hairstreak was reported from two new locations north of Boston: Rowley Stackyard Road (B. Zaremba, 1, 7/4/2011, photo on pbase), and Newbury Old Town Hill (M. Arey, 1, 7/8/2011). Both are in Essex County, further north than Woburn Horn Pond Mountain, where the species had been reported for several years, and about the same latitude as North Andover, where the species has been documented since the Atlas years. And to the south on Martha's Vineyard, high numbers (12, J. Holland) were reported from the butterfly garden at MAS Felix Neck Sanctuary on 6/28/2011. In 2012 seven Oak Hairstreaks were reported from six locations; two new locations in 2012 were Northampton Florence (6/7/2012, B. Higgins, photographed), and Wellfleet Wellfleet Bay WS (6/29/2012, M. Faherty, photographed). In 2013 a new location was added from a yard in Amherst (6/11/2013, J. Rose, photographed). Richard Hildreth wrote in the Audubon Atlas account that 1992 had been an “exceptional” year for Oak Hairstreak in Massachusetts, because at least eight individuals had been found in six locales. With hindsight, we see that the high count of that year was exceeded in several later years -- 1999 (16), 2004 (27, mainly Vineyard), and 2011 (32). BOM-MBC records 1992-2013 show that Oak Hairstreak was reported from 38 towns in the state during this period (Map 23). This compares to only 9 towns during the Atlas years. The NHESP database records it from 18 towns between 1982 and 2007. This species is found most frequently in eastern Massachusetts. The range extends throughout eastern Massachusetts from Essex County to Martha's Vineyard, with a seemingly separate population in the Connecticut River valley, and one report from the southern Berkshires. Map 23 updates NHESP 1982-2007 records and especially the MAS Atlas map by adding Martha's Vineyard and several more towns in the Connecticut River valley. It also updates the broad map from the early 1980's shown in Opler and Krizek (1984), with the addition of Cape Cod, Martha's Vineyard, Essex County, and the southern Berkshires. Is it not clear whether the 1992-2013 BOM-MBC records are simply substantiating what has actually been the range for some time, or whether, since the Atlas, Oak Hairstreak has moved northward into Essex County, southeastward into Cape Cod and the Vineyard, and expanded in the Connecticut River valley. There are no records of Oak Hairstreak from Maine, New Hampshire, or Vermont (MBS 2013; VBS 2010; NH Nat. Her. 2010). Thus Rowley, Newbury, and North Andover on Map 23 are the northernmost known locations in northeastern North America. Northeastern Massachusetts. Oak Hairstreak has recently been found in three towns: Rowley Stackyard Road (1, 7/4/2011, B. Zaremba, photo on pbase); North Andover Weir Hill TTOR (1, 7/6/2009, AG leg M. Arey, LSSS 2009); and Newbury Old Town Hill TTOR (7/8/2011 and 7/2/2012 M. Arey). Oak Hairstreak had previously been found at Weir Hill by S. Goldstein on 6/29/1991 as part of the Audubon Atlas. Closer to Boston, Oak Hairstreak has been reported from Woburn (Horn Pond Mountain), Burlington, Concord, Gloucester, and Medford (Middlesex Fells). Middlesex Fells had produced the very first records, in 1973, and a specimen during the Atlas years (6/28/1986, D. Schweitzer). The 1982-2007 map published by Massachusetts NHESP shows only Woburn and Medford, and does not show the Atlas, Lepidopterists’ Society, and MBC records from North Andover, Rowley and Newbury. South and southwest of Boston. Atlas reports were centered in this area, and MBC and NHESP both have records from many towns: NHESP has records from Uxbridge, Douglas, Worcester, Upton, Milford, Holliston, Sherborn, Wrentham, Foxboro, Sharon, Canton, and Milton. MBC records add Carver, Hingham, Hopedale, Mansfield, Natick (Broadmoor WS), and Wellesley. Cape Cod. NHESP has reports from Falmouth, Barnstable and Wellfleet. In 1981, Oak Hairstreak was found in Barnstable during an annual Xerxes Count; this was the very first report from Cape Cod. There are no records from the Audubon Atlas years. Mello and Hansen (2004) term Oak Hairstreak “rare” on the Cape. The MBC records are from Crane WMA in Falmouth, found in 1996 by B. Cassie and in 1999 by A. Robb and T. Hansen, and from Wellfleet. Oak Hairstreak was re-found at MAS Wellfleet Bay WS on 6/29/2012 by M. Faherty (confirmatory photo on picasaweb). Martha's Vineyard. Oak Hairstreak was first discovered by Matt Pelikan, who reported it from Edgartown on 7/2/1998. It was not found again on the Vineyard until 2003, and the next year an amazing 24 Oak Hairstreaks were found on the Vineyard NABA Count 7/16/2004! This must have been a local population explosion. Smaller numbers were reported in 2005, 2006, 2009 and 2011. The main locale has been Manuel Correllus State Forest. Matt Pelikan believes that Oak Hairstreak is now, ten years after it was first found, an “established breeder” on the island (M. Pelikan, pers. comm. 11/2009). West of Worcester. Oak Hairstreak has been reported much less frequently in the west. In the Connecticut River valley, the first report was from Montague during the Atlas period: 7/7/1988, M. Fairbrother (photo). MBC 1991-2013 has records of singles from five towns: East Longmeadow (6/30/2006, K. Parker), Springfield (Forest Park 7/18/1999 M. Lynch and S. Carroll), Northampton (6/7/2012, B. Higgins, ph., also 6/13/2013, T. Gagnon), Amherst (6/11/2013, J. Rose, ph. ), and Montague (7/11/1992, M. Fairbrother). Only Northampton and Montague are listed by NHESP as of 2007. In the Berkshires, a single was found in the town of either Great Barrington or Alford on the Southern Berkshire NABA Count 7/12/2003; this appears in both NHESP and MBC records. 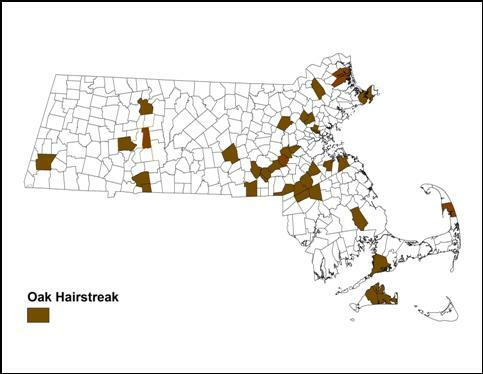 The ‘valley’ and Berkshire populations seem at this time to be disjunct from the eastern Massachusetts populations. The most productive locations, from which most MBC reports have come, are Canton Great Blue Hill max 8-10 on 6/25/2011 E. Nielsen, F. Model; Hingham Turkey Hill TTOR max 3 on 6/29/1999 B. Cassie; Martha’s Vineyard State Forest, max. 16 on 7/16/2004 M. Pelikan, and Felix Neck Sanctuary, 12 on 6/28/2011 J. Holland; and Woburn Horn Pond Mountain max 2 on 6/23/2001 M. Rines and 7/4/2011 D. Amadio. The species was last reported from Medford in 1995, but should still occur in Middlesex Fells where Robbins found it in 1973. Like all our Satyrium hairstreaks, Oak Hairstreak is single-brooded. It flies relatively early, early June through July, according to MBC records (http://www.naba.org/chapters/nabambc/flight-dates-chart.asp). It is most often seen the last week in June or the first two weeks of July. Earliest sightings: In the 23 years of BOM-MBC records 1991-2013, the five earliest "first sightings" are 6/4/2011 Woburn Horn Pond Mountain, M. Arey; 6/7/2012, Florence, B. Higgins; 6/11/2013 Amherst J. Rose; 6/11/2010, Canton Great Blue Hill S. Jaffe; 6/20/1998 Natick, Broadmoor WS, B. Bowker . The Atlas early date had been 6/23/1994, Worcester. T. Dodd. Four of these five earliest records are in the years 2010-2013. The warm springs of 2010 and 2012 produced new early flight records for many butterflies, including Oak Hairstreak. And, new early records may be being set simply because the species is increasing in numbers here. For western Massachusetts, the Oak Hairstreak seen on 6/7/2012 in the yard of B. Higgins, in Florence, Northampton, was an early record. It was seen by several observers; a confirmatory photo is at http://www.pbase.com/barbaraspencer/image/143880911 . Latest sightings: In the same 23-year period, the three latest "last sighting" dates are 7/29/2007 Hopedale, D. Price; 7/27/1999 Falmouth Crane WMA, A. Robb and T. Hansen; and 7/19/2009 Martha’s Vineyard NABA Count, M. Pelikan. The Atlas late date was similar: 26 July. The 2010-2013 records did not set any new late dates, although that would be expected if the species were increasing in numbers. Scudder gives no nineteenth-century flight dates or life history information for this species. Oak Hairstreak “does not appear to be declining and apparently expanded its range in the northeast in the 1970’s and 1980’s” according to Dale Schweitzer (NatureServe 2010). The expansion may be continuing, and Massachusetts is obviously a case in point. Whereas Oak Hairstreak was barely known and quite rare here through the 1950's, it was re-discovered in the 1970’s and is now seen almost every year. It has become established on Martha’s Vineyard in the last ten or twenty years, has been newly located in several northeastern towns, and has been found in more Connecticut River valley towns. A positive response to climate warming is no doubt one reason for this species’ presumed increase here. It is therefore listed on Table 6 as a candidate for further expansion. Its recent expansion northward is all the more surprising since, like most hairstreaks, it is fairly localized around its food plants and not known for long-distance dispersal. Massachusetts is currently the northern edge of the range for this species. Some population increase here may be expected, but the northern subspecies of Oak Hairstreak does not appear to be common anywhere in its large but patchy range. 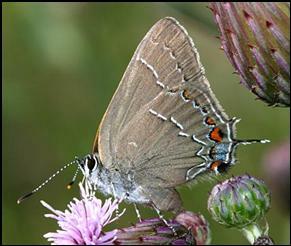 Because of its apparent rarity, the state Natural Heritage Program lists Oak Hairstreak as a species of Special Concern. Sightings should be reported at http://www.mass.gov/dfwele/dfw/nhesp/species_info/pdf/electronic_animal_form.pdf . Oak Hairstreak's NatureServe rank in Massachusetts is S2S3, or between “imperilled” and “vulnerable.” But as mentioned, there is uncertainty about its status, since it may be overlooked in high tree canopies. Its habitat of open oak forests and barrens is fairly common in Massachusetts; the habitat is easier to find than the butterfly. The Massachusetts Natural Heritage Program lists the following possible threats to Oak Hairstreak: habitat loss, fire suppression, introduced generalist parasitoids, insecticide spraying, and clear-cut timber harvesting.